This mango salso recipe goes so well with smoked ham or gammon and for we who live in hot climates, it makes a sublime cold lunch, perfect for leftover gammon from Christmas. Use this recipe as a guideline, you can add spring onions finely sliced instead of red onion, use less or more avocado, make it to your taste or what you have left in the fridge. orange juice is also a great alternative to lemon if you like it really sweet. Another idea is to use finely chopped red pepper instead of chili and of course if you have never cut a mango this way, it is the cleanest way of cutting a mango or just hand the half to a child, it’s a novel way that they will love. 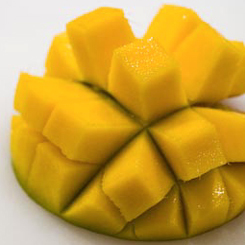 To cube a mango the easiest way is to cut flesh off the mango in 2 slices as close to the pip as possible, then score the flesh vertically and horizontally in 1 to 2 cm slices, turn it inside out and then cut the little cubes off the skin. Now add all of the ingredients to a bowl and mix them gently with a spoon to distribute all of the pieces evenly and coat in the olive oil and lemon juice. Taste and give it a grind of salt and pepper. Place your thinly sliced ham on a plate and pile up some of the salsa. It’s light and tastes fantastic, there is someting beautiful about the combination of the smoky salty ham and the sweetness of the mango. Add a few scotch eggs or Nigellas easy butternut and sweet potato soup and you have a real treat. If you had a braai for Christmas you are going to want to try this Steak salad recipe. Love mango salsa! Great use for it.